Shareholders of both British Airways and Spain's national carrier Iberia have approved the merger between the two companies. The tie-up, agreed in April, will create Europe's second-largest carrier after Air France-KLM, with a market value of around £4.5bn ($7.5bn; 5.3bn euros). The new company will be called International Airlines Group (IAG). The separate BA and Iberia brands will continue to operate as normal. However, BA shares will no longer be listed on the London stock exchange after the new year. Ninety-nine per cent of BA shareholders voted in favour of the deal, which has already been approved by the regulators. A BA spokesperson said: "We are delighted that our shareholders have approved our merger with Iberia." The two airlines began discussing a merger two years ago because of the challenging economic conditions both were facing. The British and Spanish flag carriers suffered heavy losses and struggled for survival after a fall in demand for air travel in the wake of the global credit crunch. BA shareholders will take 56% of the newly-merged company and Willie Walsh will retain his position as chief executive. Iberia's shareholders will own 44%, and its current president, Antonio Vazquez, will become chairman. Mr Vazquez suggested that the merged operator may bring other airlines into the partnership, saying that the deal with BA was an "historical agreement that will create a global group to lead a future consolidation process in the airline business." The airlines expect the merger to be completed on 21 January, with shares in the new company listing in London and Madrid on 24 January. 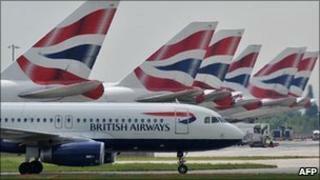 British Airways shareholders will receive shares in the new company. This will be on a like-for- like basis so that if you own 100 BA shares now, for example, you will own 100 IAG shares on 24 January. The new company will have its headquarters in Madrid, and its operational offices will be in London. The companies hope that the merger will lead to millions of pounds in savings over the next five years. Meanwhile BA cabin crew are to be balloted over whether to strike over travel perks that the union, Unite, says have not been re-instated to certain members. If workers vote in favour of a strike, industrial action could begin in the New Year. "Today we have taken a big step toward our merger with Iberia. This will create a stronger business for the long-term benefit of our customers, our shareholders and our employees. "Unite wants to lurch backwards to old-style union militancy. We are moving forwards. "